Las Vegas, NV - The Serbian Orthodox parishioners of Las Vegas finally awaited that much anticipated day. So many years of projects, collecting of donations, waiting for building permits...And when patience started to run thin, though not faith, that twenty first day of December arrived. On that day Bishop Maxim of Western America served the Divine Liturgy at St. Symeon the Myrrh-Flowing parish in Las Vegas, and consecrated the foundations of the future beautiful Church. Con-celebrating with His Grace were Fr. Sava, Hegumen of Tvrdos Monastery (Diocese of Zahum and Hercegovina), Fr. Uros Todorovic, Fr. Vasilije Sokolovic from Cleveland, Ohio, Fr. Lazar Vasiljevic, Hieromonk Fr. Jovan and Deacon Ozren Todorovic. A multitude of faithful people from this city, together with their children clad in traditional Serbian dress, joyously sang at the Lord's service and prayerfully took part in the consecration. 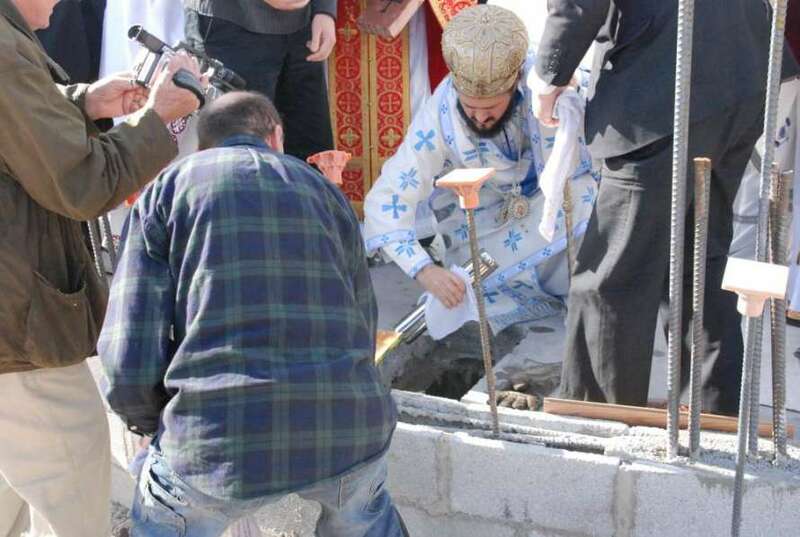 Following the Liturgy, at the foundations, at the newly set stone, the rite began with the reading of the Charter of the Laying of the Foundation, signed by Bishop Maxim, Fr. Uros, the architect Oton Urban and President of the Church Board Mladjen Grujicic. After this came the reading of prayers, singing of troparions, Psalms, the blessing of water, at the place of the Cross, the four sides of the Church and then the laying of the Charter and the cornerstone itself and finally the blessing of the people. As a crowning moment of the day's events Bishop Maxim awarded V. Rev. Uros Todorovic with the right of Cross-bearer. A formal banquet was held in the church hall afterwards, where the faces of the faithful told of their joy that this symbolic beginning incite a beginning of their own spiritual renewal, that they themselves be built into God's holy Church.